I see no delete button. Is this for a reason..? Never mind, I got it!! It worked; this is amazing! Right. There isn't any delete button, I just use the keyboard shortcut (hit delete on Mac). Does this also work on Windows? Yes. On windows you just press 'Delete' on the keyboard. Thank you. I will add this to the tutorial. @Paige1212, do you want me to do "Country Road" by John Denver? Is that the right song? 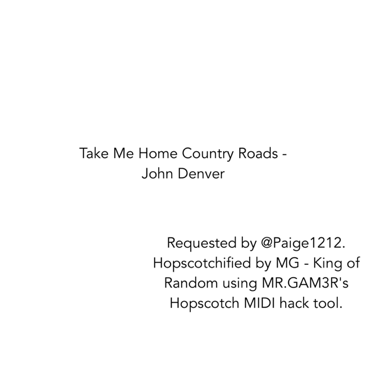 “Take Me Home Country Roads” by MG - King of Random. Made using the free Hopscotch app! This is so cool! I like that it´s simple to use with great tutorials. Amazing job! @NeoPixel your request is coming soon. The file is so huge, Hopscotch can't publish it so I need to find a way to reduce the size. @EpicGamer101 @Valgo , I uploaded a MIDI file and then clicked on the Download button. Nothing happens after that. Am I doing something wrong? @MR.GAM3R I used the website that @EpicGamer101 mentioned to make a MIDI of one of my favorite songs. I don't have any way to share it with you, though. Do you know of a website where you can upload MIDIs, or should I ask Liza for permission to share the file with you on Google Drive? I finally have fixed the issue with the MIDI hack tool where MIDI files with multiple tracks are played separately one after another, not together as they should be. All files should work as normal now.